Shale gas rig count activity is exploding right now, and is well ahead of even the impressive recovery in rig activity for conventional energy plays. 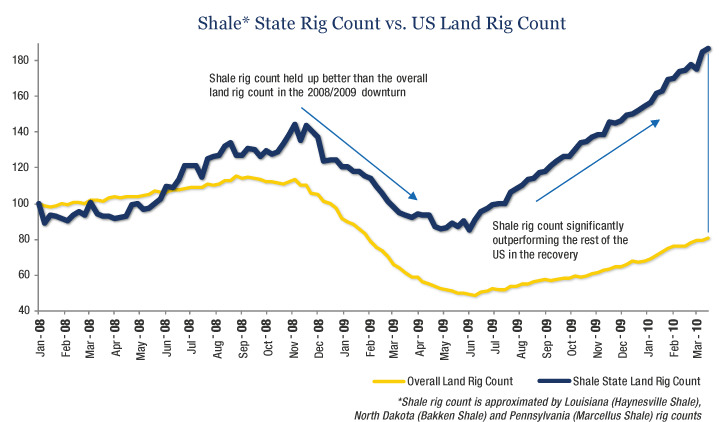 The shale state rig count index, which represents unconventional drilling activity in key basins, held up much better than the overall U.S. rig count index in the downturn (declining only about half as much). 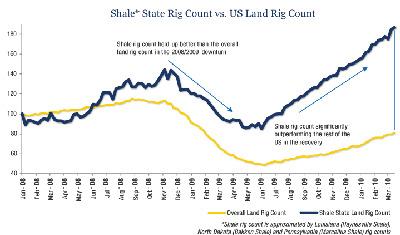 Furthermore, the shale rig index has more than doubled since the bottom — a much more significant rally than the 65% recovery for the broader market. As we predicted in our recent 2010 Q1 Land Rig Review, the North Dakota rig count recently broke through its previous record high thanks to the frenzied pace of rig hiring in the Bakken Shale. Exploration and development activity in hot shale plays like the Bakken, Haynesville and Marcellus appears poised to continue to outpace the more conventional areas. Statoil ASA bought additional natural gas shale assets from Chesapeake Energy Corp. for $253 million as Norway’s largest oil and gas producer expands abroad amid dwindling domestic reserves. The company added 59,000 net acres at Marcellus to the 600,000 acres it acquired through an agreement with Chesapeake in 2008, the Stavanger-based company said in an e-mailed statement today. This isn’t just a matter of a rising economic tide lifting all boats, as shown in the chart aboe. Combined with interest from multiple global energy majors (such as Exxon), it’s now dead obvious the boom is here. Barring the U.S. shooting itself in the foot with overly restrictive environmental regulations. The energy is here, within U.S. borders. Should we be willing to tap it.